Whenever I was about seven or eight years old, I would always watch TBS on Sundays. They would usually play a barrage of horror movies and I could never seem to get my fill. I finally did whenever I saw Jack Starrett’s Race with the Devil. This was the first film to truly terrify me because it was then I realized that not all films have a happy ending; so life must not always end happily as well. 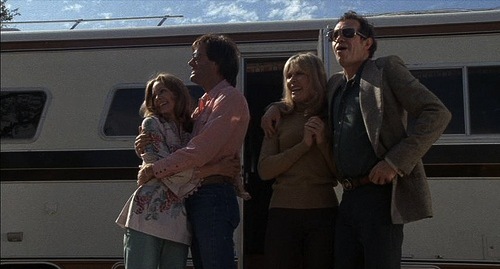 The film follows dirt bike racer Roger Marsh (Peter Fonda) and his good friend Frank Stewart (Warren Oates), who along with their wives are traveling in a brand new RV en route to Colorado for some skiing and dirt biking. Before nightfall, they take an off road detour to get some rest. (Side Note: You know how in every town there’s that one creepy dirt road that all of your friends and their brothers claim is haunted and has devil worshippers meeting there? Well, they take that road.) 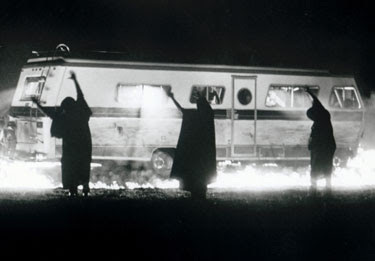 After some late night boozing, Roger and Frank spot a large fire across the lake from their RV. Using their binoculars they spy on what looks like a bunch of hooded kooks getting naked and dancing. Everything’s all fun and games until they see a young girl stabbed and killed in a sacrificial offering. Thanks to Frank’s wife (stupid women), they are spotted and immediately pursued. Making it out safely, they visit the sheriff’s office and report the incident. The sheriff and his men find no evidence at the crime scene and urge our protagonists to continue on their vacation. Relieved, they being venturing to Colorado, but things aren’t quite that simple. Very soon, they realize that they are being heavily pursued by the satanic cult and that they may be very well trapped in Hell. Or as we call it: Texas. 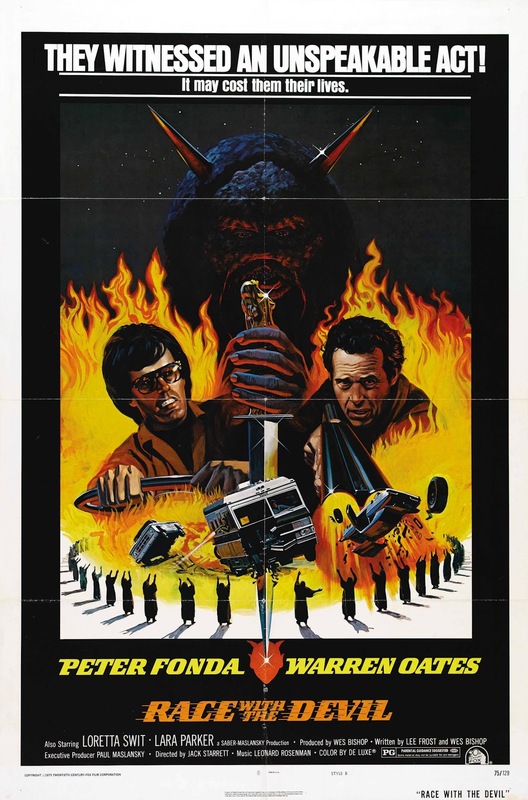 Even today, this film works because of solid acting and a creepy "can’t-trust-anyone" motif. The cult is made up of average looking men and women who use guns, vehicles and even snakes to try and stop our heroes from escaping with their secret. There’s no black magic, spells and most importantly, no Satan. 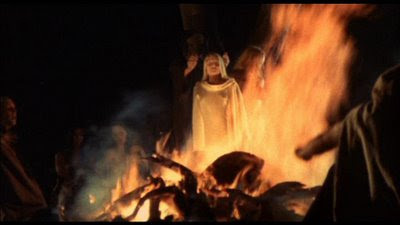 This realistic take on a satanic cult empowers the film namely because neither the main characters nor the audience know how far the cult extends. For hundreds of miles, our protagonists receive eerie glares from people of all ages. Gas station workers, police officers and road construction workers look as if they may know something, which creates unbelievably eerie tension and a feeling of entrapment that’s typically hard to pull off. The film also works because the characters are given an incredible amount of logic. They’re completely aware of everything going on around them for the most part. Roger notices that the sheriff knew where to turn to get to the crime scene without being told. They take extreme measures to protect themselves and slowly learn that they can’t trust anyone. 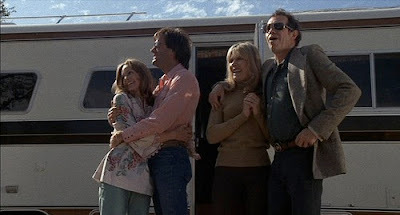 Whenever they find their RV stuck at roadblock near an overturned school bus, Frank declares "A school bus on Sunday? I don’t buy it," and speeds off. It’s then we realize that the characters are actually a bit more astute than even we are. Using a "viewer knows only as much as the characters" setup, Race with the Devil is able to remain a little known yet powerful thriller. Its ending leaves you spooked and praying that you never find yourself in that situation. 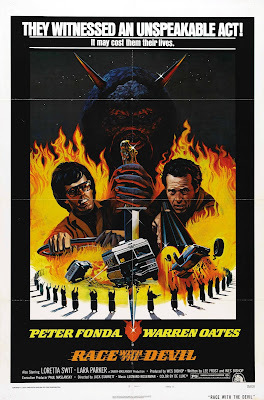 The film features some great action scenes, including a number of tense car chases, and the rattlesnakes-in-the-RV scene is equally as effective as it was when I was a child. If you can find this movie, I suggest you run like hell and grab it.